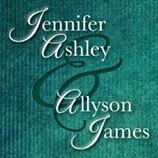 Writer's Blog: Blog of romance author Jennifer Ashley: New Website etc. Apologies for taking forever to update this blog. I've been furiously busy finishing Mate Bond (Shifters Book 7), working on the next Captain Lacey novel, and getting my websites (Allyson James and Jennifer Ashley) completely overhauled. My old one (jennifersromances) is still up, but I'm in process of sending it over to the new one. I have all info in one place, plus pull-down menus for each author and each series. Plus each series is listed in order on its series pages, and on each book's page. Go in, browse around, and have fun! If there are any problems with it, use the contact link there to let me know the error so I can get it fixed. Are you aware that your jennifer ashley website seems to be no longer working? I get a 404 error on that one. Unable to access the Allyson James website either.